Through the donation of scrapbooking and crafting materials and tools, Las Vegas scrapbookers give back to the community. We always love coming out to new cities and this year we are particularly excited to be able to leave a little something behind for the community. 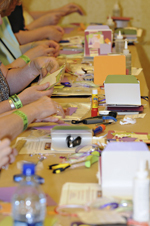 For the second year, on June 28th & 29th, scrapbooking enthusiasts from Las Vegas and the surrounding areas will come together for a weekend of creating, learning, socializing, shopping, and more. And while to the outside observer it may simply look like a bunch of people working on craft projects and shopping, to many children and families in the Las Vegas area, it means much more. This is the second year Creating Keepsakes has hosted an event in Las Vegas, but with such a notable attendance numbers last year, there was no question about coming back this year. There are two main components of the event, classes and the Vendor Faire. Attendees can sign up for classes taught by industry experts and actually learn the tricks and techniques used by the professionals. The Vendor Faire provides attendees the opportunity to shop for the latest trends and products from leading manufacturers. Creative Crafts Group consists of a diverse mix of traditional magazine publishing, online, and digital media, multiple consumer and trade events, merchandising as well as domestic and international product licensing. Creative Crafts Group’s foundation is built on nine leading consumer magazine titles with a combined circulation of 1.2 million. Creative Crafts Group consumer magazines are household names and market leaders providing content and community resources for scrapbooking, paper crafting, quilting, and sewing. The publications are Creating Keepsakes, Paper Crafts, Quilter's Newsletter, McCall's Quilting, Quiltmaker, McCall's Quick Quilts, Quilter's Home, Sew News and Creative Machine Embroidery. Creative Crafts Group is a division of New Track Media. For more information, please visit http://www.newtrackmedia.com.